Alex's Yorkie Home Page for Yorkshire Terrier Lovers. I almost made it to fourteen. I led a healthy, happy, and blessed life, but succomed to Inflammatory Bowel Disease. Folks say I was a reincarnated comedian, as I would do anything to make people laugh. "The perfect gentleman," they'd say. Always considerate and eager to please. There's plenty to see, hear, and learn in these pages, so please spend some time and look around. As long as you keep clickin', I'll always be here. I lived with Eric, Barbara, and Shooter since November 8th, 1997. When they first got me, Shooter ignored me for three days. The first day they went back to work and put me in the four-foot square X-pen, I did the King Kong routine and slowly climbed over the 30-inch X-pen and Shooter and I played all day. That day was all it took for Shooter and I to be best friends -- Partners in Crime! For the next four days, they'd say good-bye to me in the morning, and I'd greet 'em at the door when they came home. Then came a top to the X-pen! I was 100% housebroken and a few months of age, the bread winners let me have run of the house while they were at work. 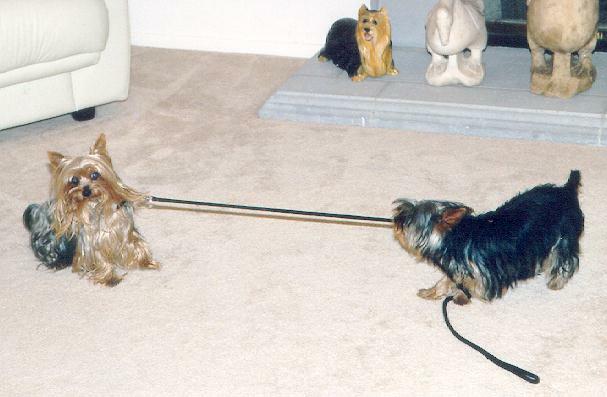 While I don't have my own domain like Shooter, I'm proud to host a Yorkie FAQ page with the technical assistance of the late Terri Shumsky: Alex's Yorkie Care FAQ page There's a lot of excellent Yorkie care information there so please check it out. Shooter and I played tug-of-war, wrestled, chased each other, and I'd steal his toys. We really had a lot of fun together. I do this cool bull scratching thing where I scratch all four paws on the ground like a bull ready to charge. It always makes 'em laugh and now it's a trick -- They say "Be a bull" or "Who's the dancer?" and I do the bull-scratch-thing and get a treat. Humans impress so easily! I have four other pages so take a look around I hope you enjoy your visit and come again soon! Visitors Since November 21, 1997.
has several pictures of Shooter and me! This RingSurf Net Ring is owned by Alex.